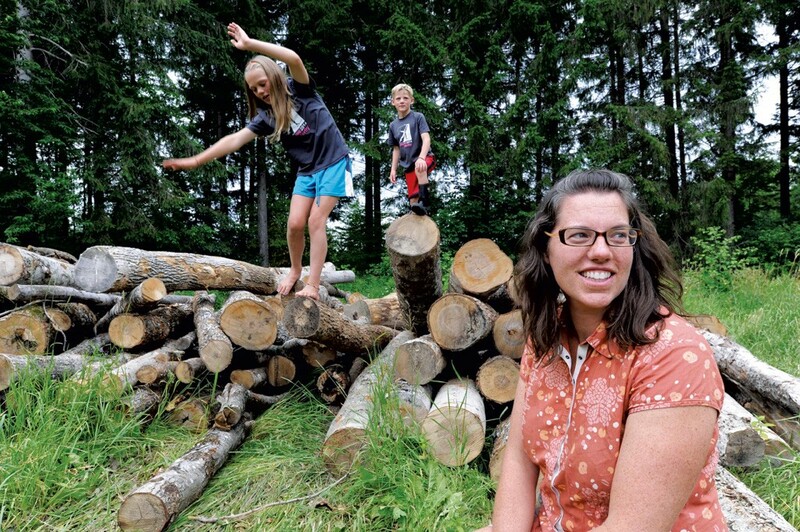 How a Nurse Midwife From Elmore Juggles Work and Family | Balancing Act | Kids VT - small people, big ideas! When Kipp Bovey was in middle school in Massachusetts, she already knew she wanted a career in childbirth some day. "I just thought it was amazing," says the 39-year-old. After graduating from the University of Vermont, she completed a three-year midwifery program in Connecticut, then landed a job as a nurse at Copley Hospital in Morrisville. When her first child, Anna, was just a year old, she began working as a midwife at Gifford Medical Center in Randolph, where she stayed for five years. During that time, she had another baby, Charlie. In 2012, Bovey returned to Copley as a midwife. These days she's on-call for two 24-hour shifts per week, plus every third weekend from Friday morning to Monday morning. It's a lot of juggling, she says, and often requires, "leaving in the middle of the night, missing things." Fortunately, she has friends to call in a pinch, and a supportive husband, Mark Isselhardt. "I couldn't do it without him," she says. Kids VT visited Bovey at her rambling farmhouse, which sits behind rows of blueberry bushes on a steep dirt road in Elmore. We talked about how she balances raising her children with delivering other people's babies. I sleep with the pager under my pillow. We found that that doesn't stop our hearts quite as much when it goes off in the middle of the night. It's a little muted. In terms of making a birth plan, you have to be flexible. You can't ensure that you're going to get what you want. And that goes on through parenting. [Birth] is just the beginning of having these assumptions, and then having them pulled out from under your feet. [This work] makes me feel incredibly lucky for the life that I have, the family I have, the support I have, the love. I see people from all spectrums, and it makes me grateful that I'm in a healthy relationship and have a loving family and the means to have what we need. We're all very comfortable with our bodies. We talk a lot about anatomy and the [birth] process. And when we see people [whose babies I have delivered] around town, the kids are always like, How do you know her? Well, I can't really go into it. What's her name? I can' t tell you that. Why not? Well, because it's her privacy, and health care's private. There were certainly times when I would lie on the couch [after a night at the hospital] and they'd watch a little TV, not as babies, but later. Mostly, you just power through. I don't drink coffee. But [as a parent to young kids] you're sleep deprived anyway, just for a different reason. You cope somehow. You get good at sleeping through the day, when you can. I love to read and garden. I just read Amy Poehler's book Yes Please. And there was a great line in there that I want to write down and stick on the refrigerator: "No is the end of a discussion, not the beginning of a negotiation." Typically it works best if we set a timer. Then we're like, "You need to be downstairs in 10 minutes," or eight minutes, depending on how groggy they are. That seems to be what gets them out of bed. Patience. I'm patient with most other things in my life, but with the kids, I'm not patient enough, and that definitely hurts my heart a little bit. And the other thing would be exercise. But there are only so many hours in the day. Watching women realize what they're capable of, physically and mentally — because labor is both. And pregnancy is both. And hearing them, when it's over, proud of themselves. They're not saying, "I couldn't have done it without you." They're saying, "I can't believe that I did it." And watching people make changes in their life about unhealthy choices, whether it be nutrition or exercise or relationships. Watching them take control. Because there are some things we have control over. Sometimes.